When we decided to spring for the M.A.X. Pass this year, I was confident we would get our money’s worth. Killington, Pico, Gore and Whiteface are all favorites. Belleayre and Windham are close to home, family-friendly mountains that I knew I could bring my kids and have a good time. But Stratton and Okemo were unknown to me. I’d heard that both hills were a bit bland, serving as playgrounds for wealthy city people, but it was my goal to use our MAX Passes to spread our wings. 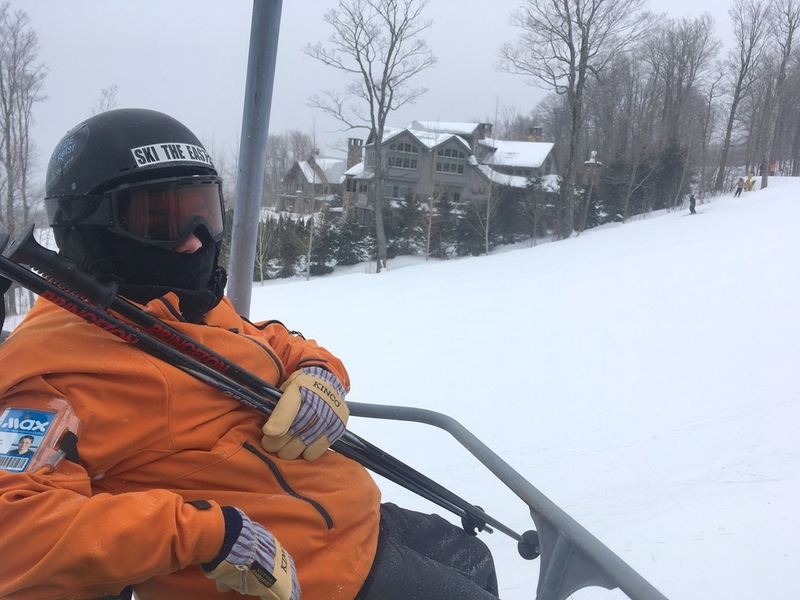 We’d already skied the Catskills a few times this season and this past Saturday was our first chance to venture farther: a day-trip to Stratton with Junior, my oldest son. Getting kids up for school every day is hard enough. The prospect of getting Junior out of bed at 5:30 AM was daunting. I’m not exactly a morning person either, but somehow I got both of us into the car and on the road by 6am, driving in darkness. Junior went right back to sleep, as he always does. He woke up as we headed up Hoosick Street towards Vermont, then drifted in and out as we finished the trip. We made good time, but it’s a long ride. We weren’t there for first chair—not even close. When we parked around 9:30, it was overcast with light snow falling; my car told me it was 4 degrees outside. I ditched my standard layering strategy and went to my NorthFace Denali as a mid layer. Junior took advantage and grabbed my vest for himself. 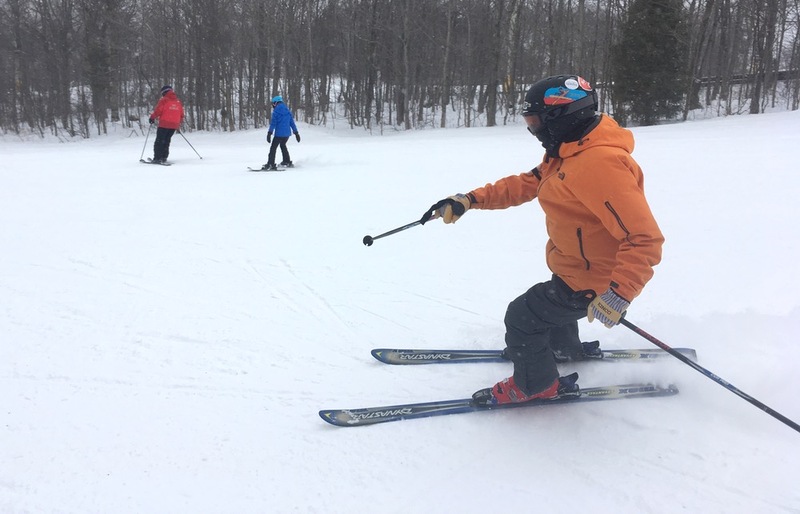 The Stratton skiers we saw were not deterred by the cold on Saturday. The place was bustling with activity. The line for the gondola was already pretty long so we jumped on one of the other lifts and started learning our way around. The quad brought us past some beautiful slope-side houses—leading Junior into his bit about rubbing elbows with the 1%—perfected earlier this year at Windham. When we finally skied, the snow was good. There was enough open to spread the out the traffic. I found that selecting a black diamond rated trail ensured a lack of crowd, steepness or challenge. After exploring a little more we decided to take the gondola to the top. As we went to enter the the maze, a liftie asked me something, but I couldn’t hear over the wind. She pointed to the back of the line, where we were headed anyway so I forgot about it. It was even colder at the top and completely socked in. We polled across the top and dropped down the other side, taking Black Bear down to Polar Bear. It was just what we needed at that moment. It wasn’t crowded and was easy to lap from one of the upper mountain lifts so we hung out there, until lunchtime, when we headed down to the Sunrise Lodge. This side of the mountain was less crowded then the village side of the resort. 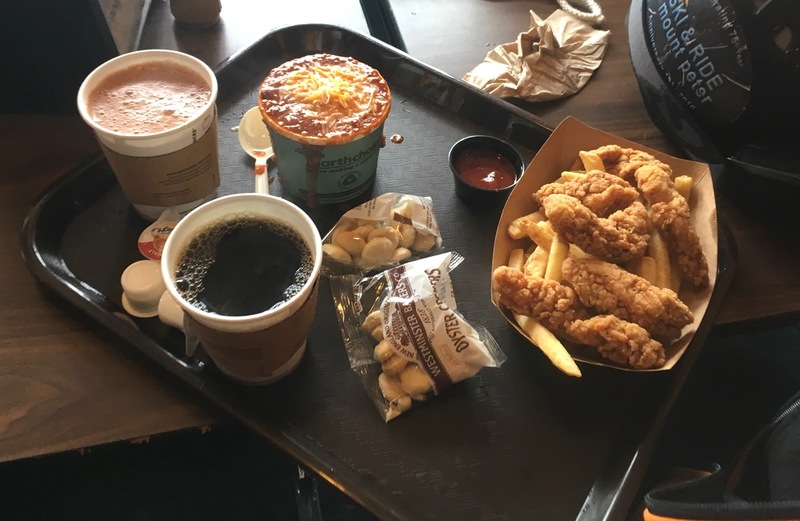 We warmed up with chili and chicken fingers and hot beverages. 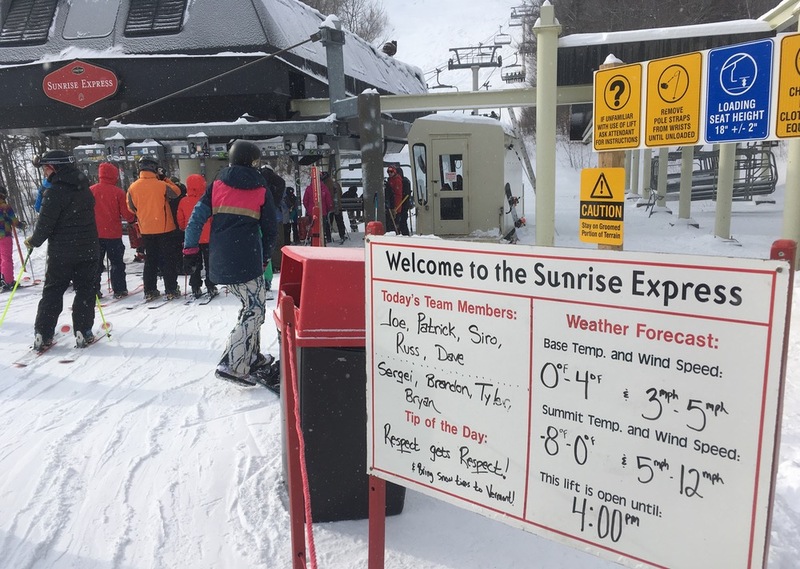 After lunch we got on the Sunrise Express, another of the several high speed six-packs at Stratton. We spent the rest of our day exploring that side of the mountain. There were some closed trails over there but there was good cover on what was open and the light flurries helped. It was here, in the Sunrise Express lifeline that I realized what the liftie at the gondola had been telling me. 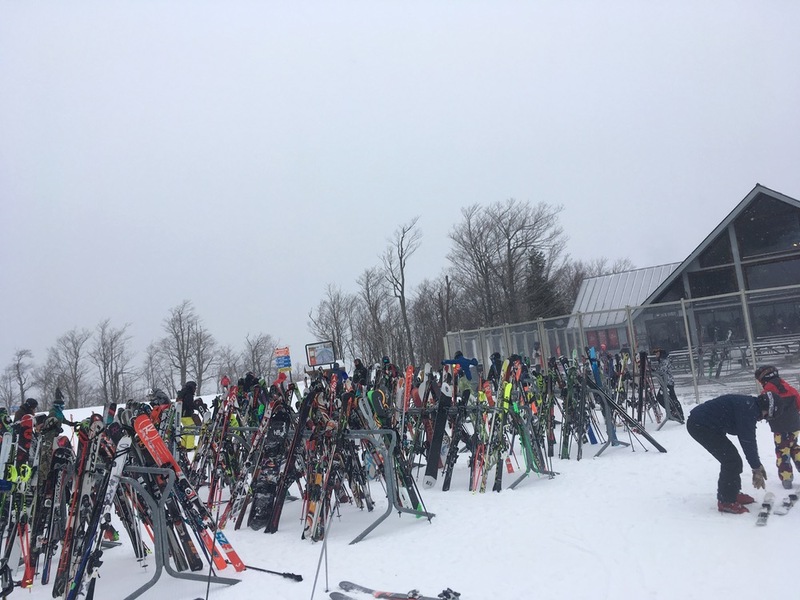 I saw a sign on one lane that said “speed bear pass required.” Apparently there is a pass product available to Stratton Club members that’s the equivalent of a speed-pass at an amusement park, allowing you bypass much of the line for a price. We headed back to the village at the end of a good, fun day. While the terrain wasn’t all that challenging, I was skiing with Junior and I wasn’t really looking to get into anything too gnarly. After a stop in Albany to get some Ted’s Fish Fry, we made our way back south. We put in probably close to seven hours in the car for six hours on the snow. I can certainly see why the resort is a destination. 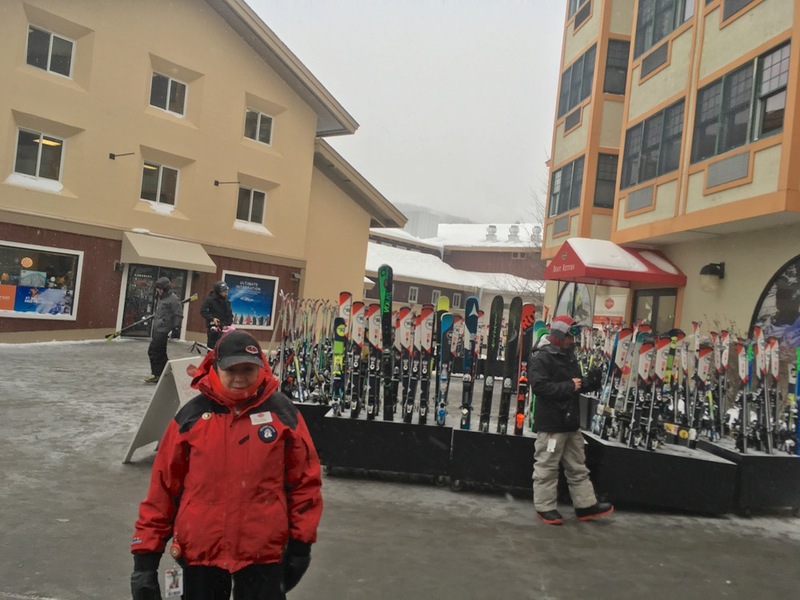 Stratton is a long day-trip from the metro area and well equipped to entertain their customers overnight. Any tree runs? I know, maybe not now, but, on the map? Benny- There are glades on the map. What I could see from the sunrise chair looked a little boney right now but they’d be nice after a big storm. We cut through one little beginners’ glade (really wide open) on the village side that was ok.
It’s cool watching people spread their wings with the MAX. 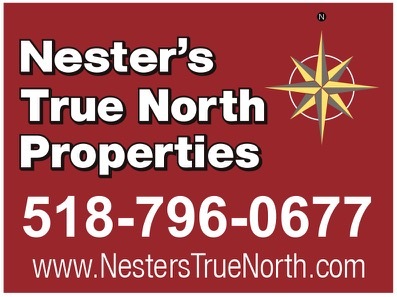 It’s a no-brainer for so many. I skied Stratton once maybe a dozen years ago in the spring and there were a lot of trees in play. I remember that they had “rated” some of those blue which I thought was helpful. Maybe a liability, but cool for me as I was just learning to ski trees. There’s an awful lot of skiing on that pass. I’m just waiting for the east to thaw, and snow out west. It’s looking very bad out there. It’s always nice to cross a mountain off the list. Stratton has some ok things about it, I appreciate standing at the top of that summit and taking in the view but it is not the most challenging mountain. Isn’t it World Cup that’s there premier double black? I remember it being a short but steepish face. Yes, World Cup is their steepest run. 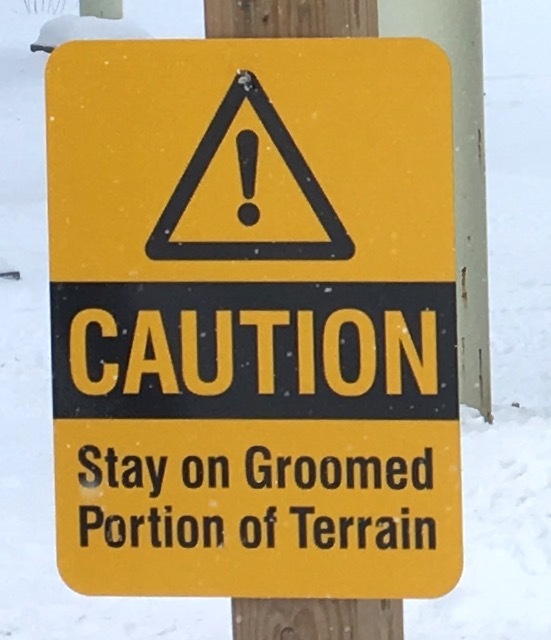 The glades are also fun, but there isn’t much steep or challenging terrain and the place just grooms too much and, as a result, combined with the large crowds, I find it gets skied off quicker than other mountains.